Questions: What are you up to this weekend? What did you have for lunch today? Salmon is so good with lemon juice isn't it? 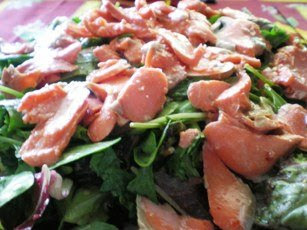 Can't go wrong with salmon and some greens. ;-) Healthy and delicious. LOVE salmon...love it!!! This weekend we have company, which is fun, but exhausting. And today for lunch I had some sliced cheese, grapes and bread....very French and VERY delicious! I love date nights! Hope you had fun! I love fungus...be mushrooms, shiitake, or Pfifferling....stir-fried, or in soup, or cooked with rice. They are just too good to miss in life. p.s. Do you exercise often? I do yoga 6 days per week....well, if I didn't exercise, I bet I would have gained more than 10kg ever since I started baking!! YUM! This salad looks great!